The sheer cliff drops down to the top of a rocky escarpment, which itself falls into a rippling ocean of never ending blue that is the Aegean Sea. 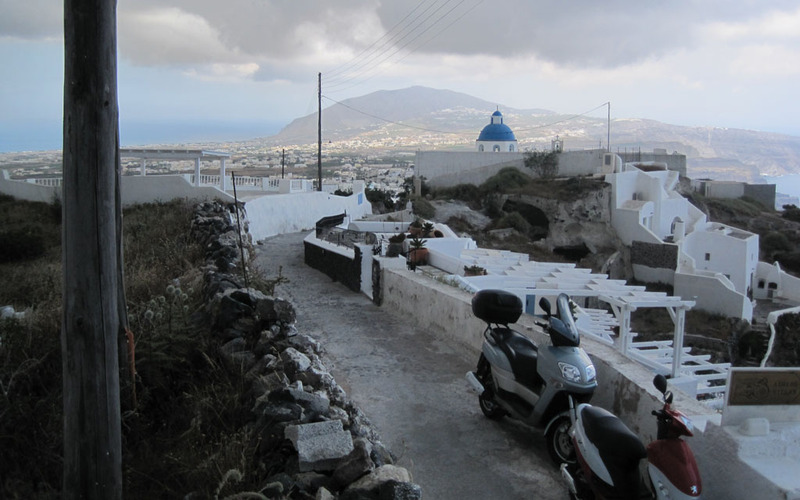 Along the crater’s edge, a cluster of whitewashed villages and blue domed churches, cling to the edges of the cliffs. 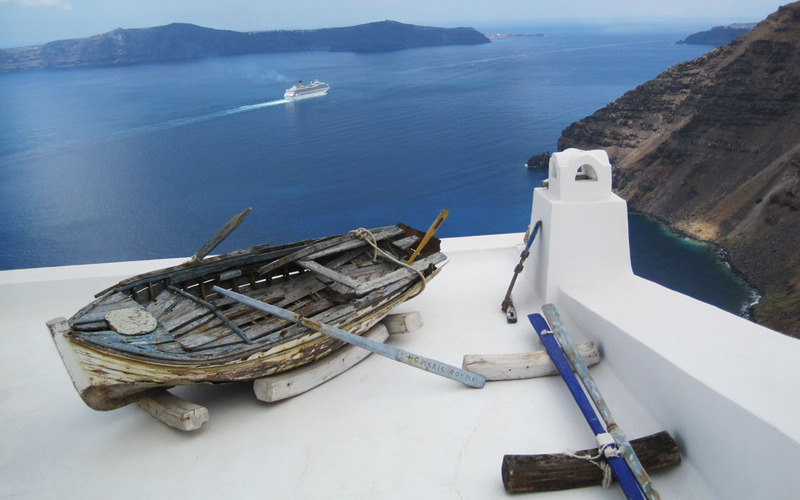 Most of us are familiar with Santorini’s iconic geography and architectural marvels, which overlook an azure blue sea. However it is not enough to be mesmerised by these images from a far, Santorini simply must be seen up close. And that is exactly what Nick, Georgie and I did. Arriving by ferry from Crete, Santorini (our second port of call on our three and half month trip from Greece to Russia), was every bit the Greek Island paradise that I had envisaged before stepping onto its rocky shore. I had thought about the island many times – lost in the imaginings of the Greek Island’s sunlit passageways, cloudless blue sky, and sunburnt orange horizon – during London’s relentless, cold and dreary winter days. After a short bus ride from Santorini’s seaside town of Perissa, we found ourselves on the rugged cliffs of Santorini’s capital – Firá, encircled by insanely beautiful surroundings. The glistening blue water, magnificent steep hills and clusters of small village houses (which have become synonymous with the island), provided the perfect starting point for the walk that we were about to embark on. The trail that laid before us followed the edge of the cliffs themselves, making our feet the perfect mode of transport to explore and discover the island’s truly phenomenal natural beauty. 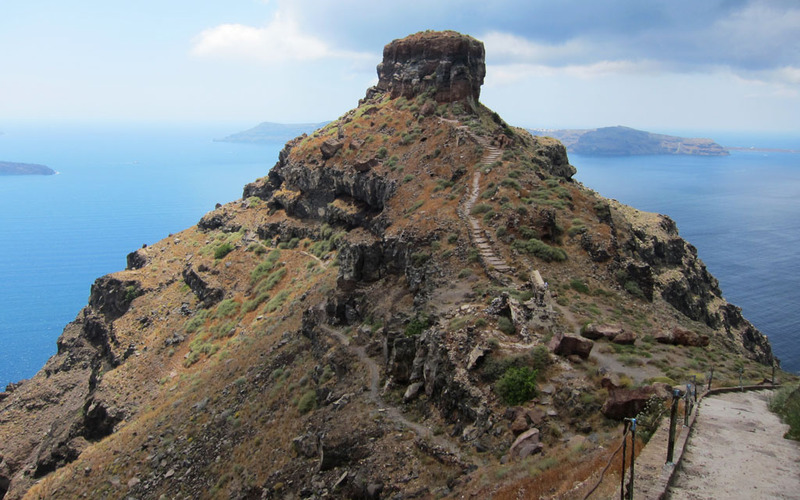 Indeed, the only way to really see and explore Santorini’s incredible landscape and remarkable architecture is by foot. Of course there are other transport options to get around to the islands main points of interest. You can rent a car, moped, quad bike, or take the local bus. However relying solely on any one of these options you will be sure to miss seeing some truly amazing sights. 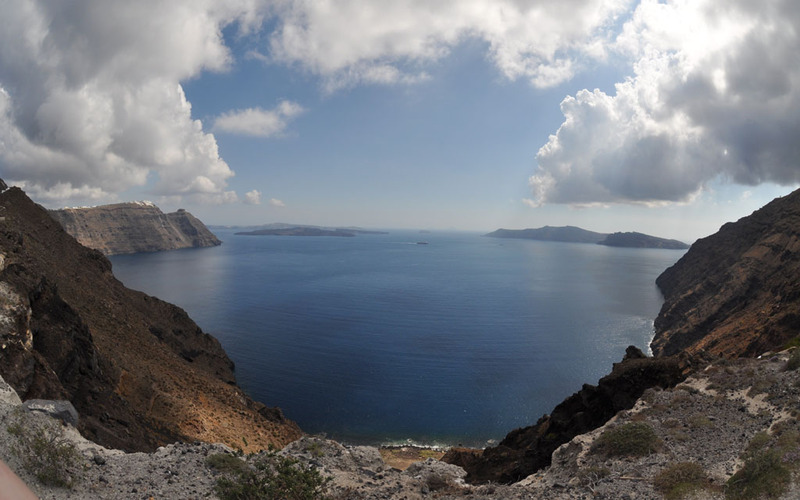 To experience the caldera in all its glory there’s simply no better way than by following the walking trail from the old town of Firá to Oia. 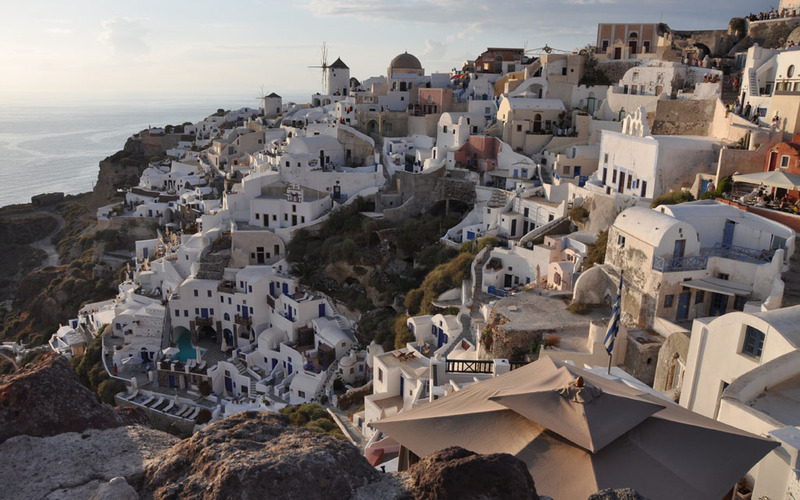 The 11 kilometre stretch follows the rim of Santorini’s basin shaped crater and offers up an ever changing terrain of cobbled streets, seaside roads, dirt tracks and rocky escarpments as it passes cliff dwelling villages, monasteries and chapels. Before setting out, I was concerned that the trail would be overflowing with other travellers. Initially the area near Firá was crowded but people seemed to peter out fairly quickly and we soon found ourselves alone on the path. Apart from a handful of other walkers Nick, Georgie and l mostly shared our journey with the local dogs. Perhaps this was due to the heat. Summer temperatures in Santorini do tend to hang around the high 20s (centigrade). Or maybe it is to do with the preconceptions people held of what the walk would be like. While the walk is a mixture of uphill and downhill, and can be quite steep in parts, generally speaking it should only take about four hours or so to complete. Keep in mind that’s at a leisurely pace and allowing for quite a few photo stops. Whatever the pace, you will be rewarded for the effort upon reaching the caldera’s northern tip at sundown. From here the views stretch out as far as the eye can see. You don’t have to wait till the end of the walk for incredible views though. At every step are spectacular panoramas of the surrounding islands, the lagoon, and the active volcano that lies in the middle of the archipelago. The volcano’s last recorded activity was in 1950, but thankfully since then it has continued to lay dormant. Today the volcano provides travellers with an incredible day-trip of climbing over lava covered rocks, soaking in the naturally formed volcanic hot springs and feeling the benefits of the therapeutic volcanic mud. It is startling to think that Santorini encompasses an active volcano, and it is fascinating to note that the island itself is actually the remnants of a massive volcanic explosion that occurred thousands of years ago. It was this massive eruption that led to the shaping of the island’s truly unique and dramatic formation. Walking along the trail towards the west coast we were treated to magnificent views of sheer cliff drops, then as we turned towards the east we were greeted with sprawling farmland, where the coast simply rolls slowly out to sea. One thing that remained constant was the unbelievably blue water that surrounds the island. Just as striking as the landscape is the unique architecture of the villages such as that of Firostefani and Imerovigli. Small village houses, stacked on top of each other, looking as if they’re clinging on to the cliff for dear life. It’s hard to imagine how exactly they were built. 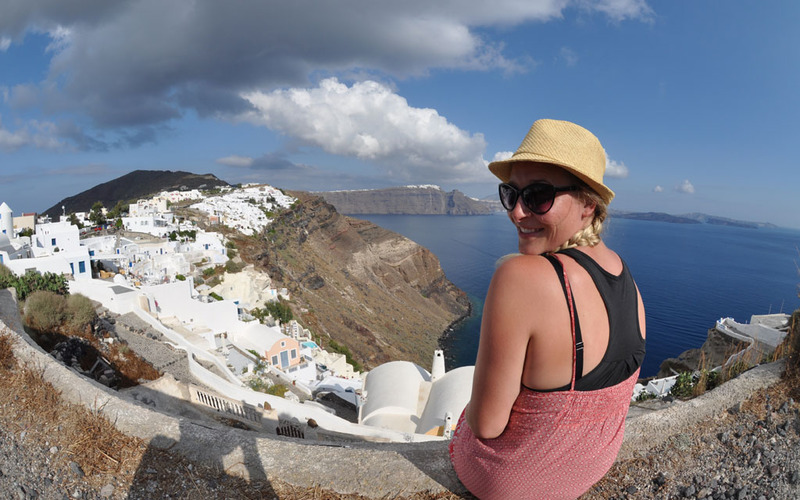 Continuing on with our journey, winding our way through the narrow passageways of Santorini’s charming villages we passed sun drenched verandas, dozing cats, wooden windmills, bougainvillea covered terraces, and ringing bell towers. As we passed by such sights I could not help but feel as though we’d somehow stepped into a postcard. 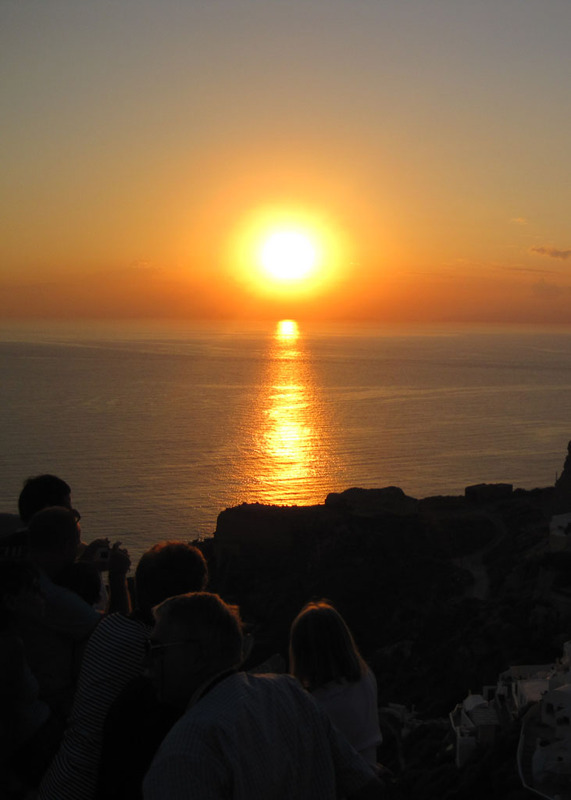 Finally, as we arrived at the northern tip of the caldera, upon which the town of Oia perches, we gathered with hundreds of others, all waiting for the moment when the sun dips below the horizon. 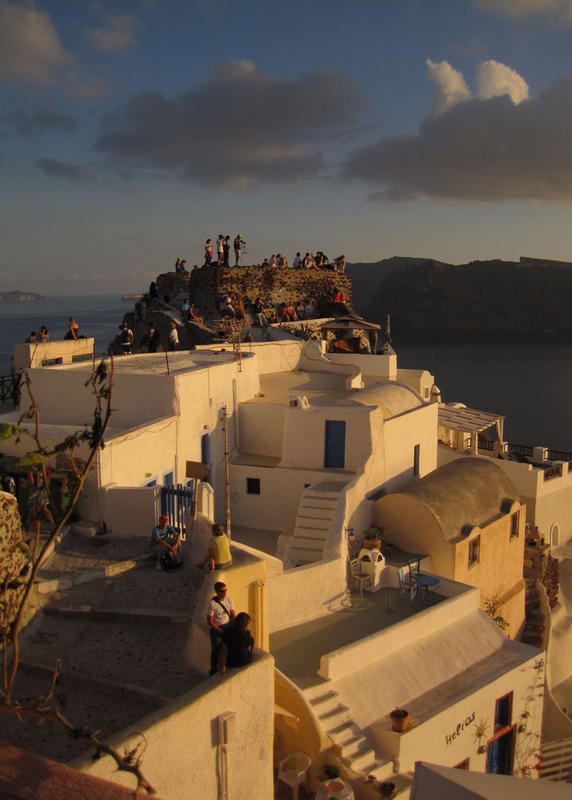 Watching the sunset upon Oia’s rocky coast has become somewhat of a ritual on the island. Each day a flock of sun worshippers descend upon the village, which itself oozes with charm. In the moments before sundown, the zigzag alleyways and the steep stairways leading down to the fortified walls of the ruined castle became crowded with travellers from all around the world. As the sky became illuminated with bold streaks of yellow, pink and orange, the seaside village became bathed in a warm yellow light. The sea also caught the gleam of the setting sun, making each ripple of water dance and shimmer. It was one of those moments where when you stop, look around, all you can say is ‘this life is pretty amazing’. An almighty applause, from the crowd was given, to mark the end of the spectacular natural light show. And as the sky that was only just a few moments ago filled with yellow and burnt orange hues fades into oblivion, an ever-darkening blue returned to the sky. With the light fading fast, we boarded the bus back to Firá. Santorini’s International Airport has daily flight connections with Athens from about €70 one way and takes around 40 minutes. This family run hotel is ideally located, just a short walk from the main street and to the black volcanic sandy beach of Perissa. Daily ferries travel to and from Athinios Port to surrounding islands. 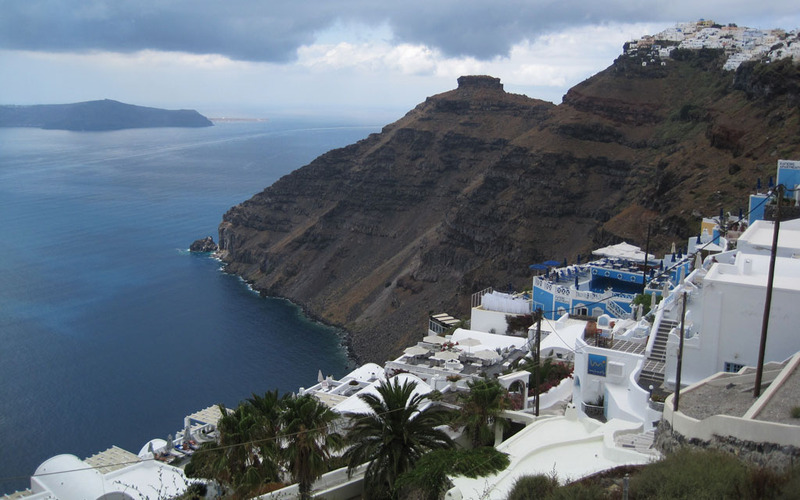 An 11 kilometre stretch that follows along Santorini's rugged cliffs and stunning coastline. A must do on any Santorini itinerary.